Born in New Jersey and raised in rural New York, Barbara Wiedemann received her B.A. from the State University of New York at Buffalo, her M.A. and Ph.D. from University of South Florida. She resides in Montgomery, Alabama, where she is a professor emerita of English at Auburn University Montgomery. She taught American literature (including a course on contemporary Southern women writers) and creative writing (poetry). Her scholarly work has generally focused on modern and contemporary American writers resulting in Josephine Herbst: A Window to her Life and Times, journal articles, and numerous reference book essays. In the past few years, she has turned her attention to writing poetry. Her inspiration sometimes comes from her travels. Escaping the heat and humidity of summer in Montgomery, she heads west, and for a few months, she lives in her van, camping in remote areas in the national forests and BLM lands. Often her only companion is her dog. These experiences form the basis of her first chapbook Half-Life of Love (Finishing Line Press, 2008). Her next chapbook Sometime in October (Finishing Line Press, 2010) developed out of the realization that if family stories are not told, they will be soon forgotten and irretrievable. 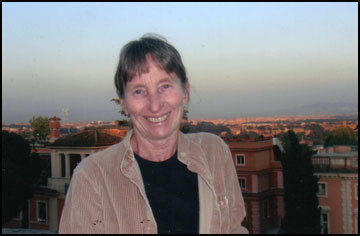 Her third chapbook, The Death of the Pope and Other Poems (Finishing Line Press, 2013), resulted from her connection to Rome that has stretched over fifteen years. The title poem grew out of her six-week stay at the American Academy in Rome as a Visiting Artist during the final illness and death of Pope John Paul II. The catalyst for her most recent chapbook Desert Meditations (Finishing Line Press, 2018) came from her five months hiking the Pacific Crest Trail with her dog Angel in 2015. In these poems Wiedemann suggests that the stillness and solitude found in the natural world is a necessary antidote to the hectic pace of today's technology-driven environment. She does several readings a year, and her poems have been published in a wide range of journals including American Whitewater, South American Explorers, Lilitamba, and Feminist Studies. In the spring of 2016 she was a Visiting Artist at the American Academy in Rome.